In I showed how Japan’s first and more massive real estate bubble peaked in 1991. And then showed how it crashed right along our bubble model into 2013. The difference was, it never bounced. Even when its Millennial generation came along to buy houses again. 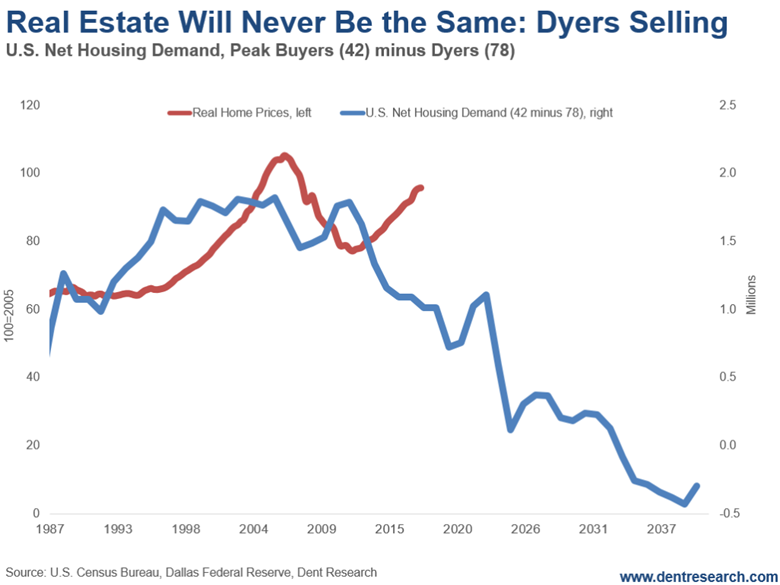 A rise of “dyers” (sellers) were offsetting the rise of Millennial buyers. Now let’s look at the U.S. bubble – or our double bubble. Our first bubble peaked after peak demand from Boomers (2003) in early 2006 on a 41-year lag. Ant it crashed. The demographic downturn we predicted set in after 2007. Right when the sub-prime lending crisis blew up. It took six years to build, and six years to crash into 2012. That’s down 34% versus Japan’s whopping 70% over 13 years. Massive QE and ultra-low mortgage rates created a second – now artificial bubble – that has recently eclipsed the first one. And it looks almost identical in its size and buildup time – six years from 2012 into 2018. This bubble will burst within the next year. Its target is the low of 2012, and likely the low of early 2000. That creates a 40% to 50% downside in the next six years, into 2024-2025 or so. 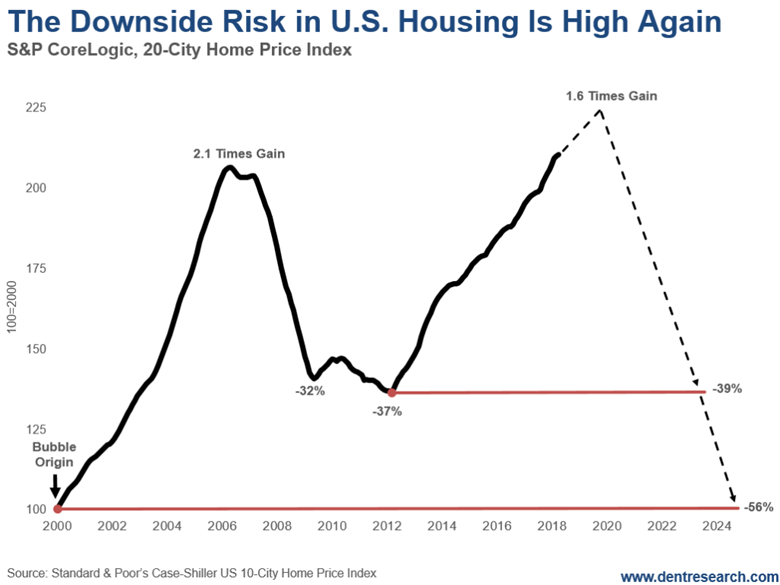 So, what has happened since the first serious real estate downturn since the one from 1925 through 1933? According to a study by the online apartment service RENTCafé, since 2007 ownership has dropped by 3.6 million and renters have gone up by 1.9 million. Yes, that means more Millennials living with parents, and rising homelessness. Home prices have gone up 35%, while rent is up only 20% in the last five years, making home prices 75% more expensive than rental prices. Both are way above wage gains, which have been near nil. Overall, the bubble and crash thus far are not nearly as bad as Japan. Our demographics aren’t as unfavorable, but still very much so given the new model of subtracting dyers from peak buyers. In this case, peak buying in the future is at age 42 for the U.S. and age 78 for dyers, as we don’t live as long as the Japanese on average. So, even if we hit a bottom by 2025 when the highest numbers of Boomers die, prices will still be likely flat to down a bit into 2039 or so. There’s a big difference from Japan’s demographic spiral. Net demand does not turn negative until 2032 – so we won’t have tens of millions of empty homes like Japan. Builders will be even more cautious next time around, as will buyers, at first. Millennials will ultimately choose to buy just to control their own house and destiny, even though appreciation is unlikely to top modest inflation. The demand for vacation and retirement homes will peak last for the aging Baby Boomer generation around 2026. That would be the best time to sell those homes, if you don’t near term, to avoid a bigger crash ahead. The best thing you can do is convince your kids to wait until at least 2024 to buy – and be happy renting until then. They should look to other financial investments to build their wealth. Whether it be stocks in the booming emerging nations (like India and Southeast Asia). Or the next great commodity boom that’ll favor metals. Nadeem these soothsayers articles bring down the credibility to such an otherwise informative site. Dent also predicted a 50% drop in the S&P 500 for year 2013 which ended up over 13%. DOW 40,000 by 2010. Oops, wrong again. Nothing but outlandish predictions to garner attention and sell books. How about Dent's exchange traded funds that were shut down? The list goes on. If he says sell real estate, probably a great time to continue holding. sold it all the way UP!